100% Export Oriented Unit of a wide range of products which include japanese prayer beads and mysore sandalwood bracelets. 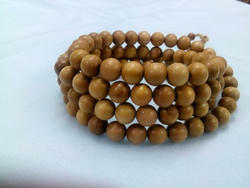 Sandalwood beads is one of the tradictional meterial used for chanting beads . The world best queality sandalwood found india only. This sandalwood used for party , gift purpose ,Occation and many things used for . We are provide to our all most valueable customer for good queality.